Normally, the blood clot that forms after a tooth is removed promotes healing, laying the foundation for the growth of new bone tissue. 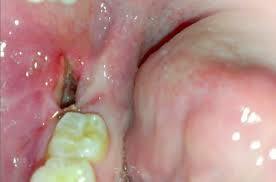 When dry socket occurs, this blood clot is lost and the infected, inflamed socket appears empty — hence the name. Nerves are exposed, and sometimes the bone is visible in the empty socket. You may not have symptoms until 3 to 5 days after the extraction. Then, the condition will manifest itself as severe pain that doesn’t subside, often accompanied by what feels like an earache. You may also have an unpleasant taste in your mouth, and bad breath. • keep your fingers and tongue away from the extraction site. • apply an ice pack to your jaw for the first 24 hours following surgery — on for 15-20 minutes, and off for 30-40 minutes — to prevent pain and swelling and stop excessive bleeding. • not rinse your mouth the day of surgery. The next day, you can rinse gently with warm salt water; dissolve one teaspoon of salt in a cup of warm water. Be sure to rinse and spit gently. Call our office right away if you notice any symptoms of dry socket. Treatment for dry socket typically includes a gentle rinsing of the socket. We then pack it with topical anesthetic and a sterile gauze dressing. You’ll usually need to return to our office two to three times over a two-week time period so we can change the dressing and monitor the healing.